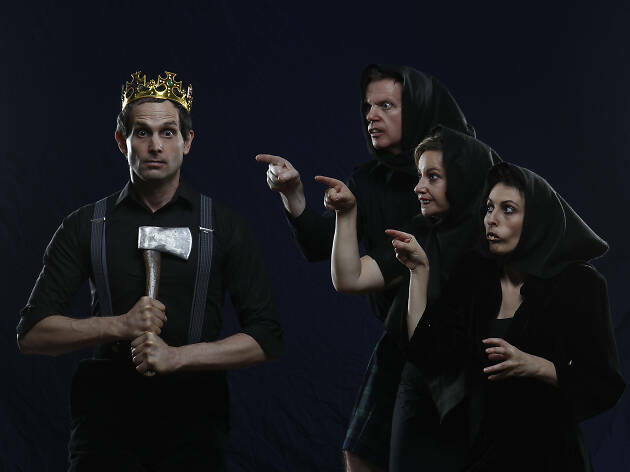 If you tilt your head in the right direction, Shakespeare’s grand gothic tragedy Macbeth could look a bit like a slapstick comedy of bad manners. I mean, you’d have to tilt it pretty far in that direction, but physical theatre outfit Company 13 have gone some way to show us what it might look like. Their Comedy Festival show Macdeth is a rendition of sorts of the original tale, albeit with booger jokes and a lot of milk arrowroot biscuits. It starts not with the witches but Duncan (John Forman) claiming victory in the civil war that sees Macbeth (Christian Bagin) and Banquo (James Pratt) rise in reputation and dignity. Forman is a king in The Goons mode, chock full of silly voices and flatulence problems. Pratt plays Banquo, and later Macduff, with a strong jaw and a tragedian’s loftiness. But it’s Bagin, as a Macbeth with an inexplicable Eastern European accent and an endearingly rubbery face, that really manages to bridge the show’s competing styles. His traitorous thane is in some ways more frightening than the prototype; he’s a Machiavel who hides behind a belief in his own innocence. The cast is rounded out by Fiona Roake, who is hilarious as mummy witch, and quite convincing as Lady Macbeth, even if her mad scene feels a little underdone. 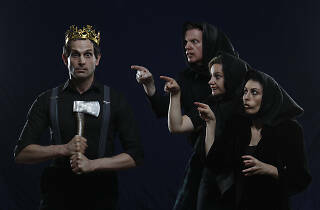 In some ways, the whole production feels underdone; there’s a lot of wackiness but not enough sense of real danger, and while some scenes are inspired in their stupidity – the spread the Macbeths lay out for the visiting Duncan is gorgeously daggy – there are too many that merely tread the outline of Macbeth’s plot. Trump references feel tacked on, even if one or two manage to bite. Company 13 have a wealth of talent in their ranks – Bagin is such a natural physical comedian it seems bizarre he hasn’t been snatched up by commercial television – but this work sits uncomfortably between two unbridgeable worlds. Even with the head tilt.